Today, we visited more neighborhoods of Chicago. 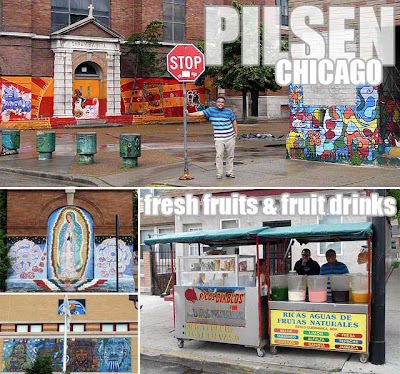 Aside from Little Village which I visited weeks ago, another Mexican community of Chicago is Pilsen. 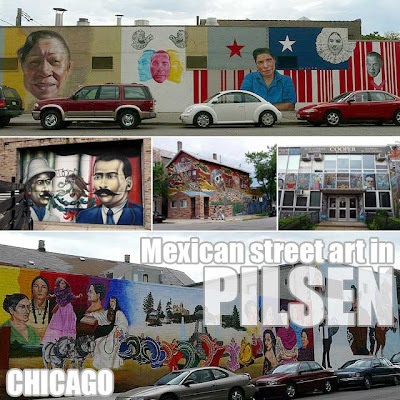 The group did a lot of walking to check out the Mexican street art which is all over Pilsen. The murals are wonderfully-done and very symbolic, filled with a lot of elements from Mexican culture and history. Some are expressions of the situation of Mexicans in the United States. There are a lot of fresh fruit stands around and we tried their local mangoes which taste like our Indian mangoes in the Philippines. It was raining at times so we weren't able to maximize our tour around Pilsen. But I sure did enjoy the street art. We went next to the Puerto Rican community along Paseo Boricua. The funny thing about Chicago weather is that it is so unpredictable since the sun was out by the time we got there. Just like in Pilsen, we walked around and explored the street. I made sure to try the local food. I had been tipped about a fried banana and meat snack called alcapurrias unique to the Puerto Rican community and was happy to find it in one of the shops. I also had some morcillas (blood sausages) which are different from the ones I had in Spain since the ones here are made mostly out of rice. After a late Puerto Rican lunch, we proceeded to Oakbrook Terrace, IL since we were going to watch the Buddy Holly Story at the Drury Lane Theatre later in the evening.